FILE - Britain's Prince Harry and Meghan Markle attend a Service of Thanksgiving and Commemoration on ANZAC Day at Westminster Abbey in London, April 25, 2018. 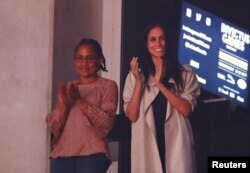 FILE - Meghan Markle, girlfriend of Britain's Prince Harry, and her mother Doria Ragland watch the closing ceremony for the Invictus Games in Toronto, Ontario, Canada, Sept. 30, 2017. FILE - This Nov. 28, 2017 file photo shows a general view of St George's Chapel within the walls of of Windsor Castle, in Windsor, England. Britain's Prince Harry and Meghan Markle will marry at the chapel on May 19, 2018. 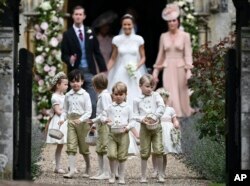 FILE - Britain's Prince George, foreground center, reacts after the wedding of his aunt, Pippa Middleton to James Matthews, at St Mark's Church in Englefield, England on May 20, 2017. 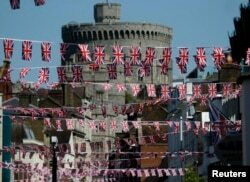 Union Jack flags fly across the main shopping street in Windsor, May 15, 2018.